Holly is a popular plant among home gardeners and landscapers alike. Versatile and hardy, it can be grown as a tree, shrub or hedge. The evergreen leaves are distinctive and attractive, and many types of holly have bright red berries that add winter interest to the garden. There are more than 700 species of holly (genus Ilex), according to the University of Illinois, and thousands of varieties, although only 40 or so are commonly used in home landscapes. Japanese holly is evergreen, with dark, almost black berries. Most cultivars have very small leaves similar to that of boxwood, according to Clemson University, and are grown as shrubs. They range in size from 3 to 10 feet tall and wide. Like many other varieties of holly, Japanese holly can be vigorously pruned. "Convexa" is a particularly large cultivar of I. crenata that can reach a height of 9 feet and a width of 24 feet. 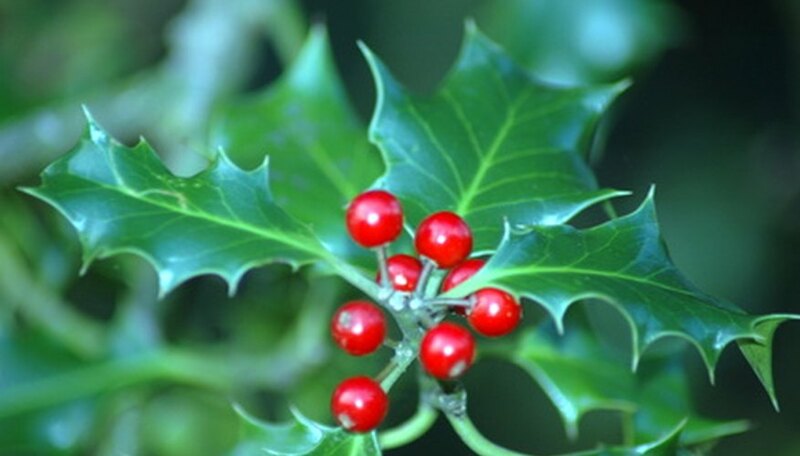 American holly is very popular for its spiny, bright-green leaves and deep scarlet berries. Most cultivars of American holly grow as trees, some of which can reach heights of 50 feet. "Merry Christmas" is a traditional-looking cultivar with showy red berries and shiny green, spiny leaves. "Yellow Berry," as the name implies, has yellow berries and "Stewart's Silver Crown" has variegated leaves. Yaupon holly is native to the eastern and southern part of the United States. It is different from many other types of hollies because it has smooth-edged, ovate, light-green leaves. This holly has red berries and is also on the small side, growing as a tree and reaching maximum heights of 15 feet. On the plus side, yaupon holly tolerates hot, dry conditions better than most other types of holly, according to Clemson University. "Penula" is an attractive, weeping cultivar. Chinese hollies are most desirable for their ability to make berries without being pollinated. Most other types of hollies are either male or female. Chinese hollies have large, deep green, spiny-edged leaves. The leaves are exceptionally shiny. Some cultivars grow as a tree, while others grow more as a hedge, such as "Burford," which can grow up to 20 feet tall and wide. "Berries Jubilee" grows in a neat, mounded shape and has a lot of bright-red berries.